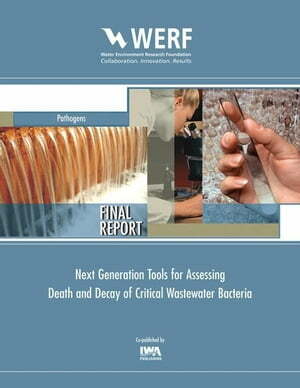 Collins Booksellers - Next Generation Tools for Assessing Death and Decay of Critical Wastewater Bacteria by Pruden, Amy, 9781780408194. Buy this book online. This work used a combination of traditional microbiological and molecular approaches and modeling to advance understanding of decay processes in wastewater treatment. The overall goal was to support improved design and quality control of nitrification and pathogen inactivation processes considerate of more precise estimates of decay parameters.Pathogen and indicator decay experiments were framed with respect to USPEA time-temperature requirements in biosolids. Non-specific molecular methods, such as ATP and live/dead staining, were informative in pure culture but were not suitable as a proxy for pathogen or indicator monitoring in sludge. Existing USEPA time-temperature Class A biosolid regulations are based on CFU; however, DNA persistence suggests that non-cultured microorganisms correspondingly persist. DNA-targeted monitoring holds promise for detection of intact cells in sludge, but more work is necessary to ascertain the viability and infectivity.AOB and NOB measured decay rates were lower than literature values and there was a decline in AOB decay rates at temperatures above 25°C under the conditions of this study. Reduced decay rates have the most impact under extreme conditions, such as high ammonia loading or low temperatures, where lower decay rates translate to higher active biomass concentrations, lower ammonia peaks, and reduced times without nitrification.